We just posted a new invite for Coffee with Cole … all I can say is that I love these. Each time I have one I leave feeling so energized by the interactions. I enjoy the informal setting and the opportunity to just sit back and talk to one another. When I was at Penn State, my CIO held similar sessions and I never attended — I guess I figured since I worked for him on a regular basis that it wasn’t for me. He always told me otherwise, but I wanted to leave a seat for others to get a chance to hang out with him. I just simply didn’t understand how different getting together over coffee creates a different dynamic. The conversations are about us in a very different way when it isn’t a staff meeting, an IT Partners gathering, or a meeting in general. It gives us a chance to get to know one another in a more holistic way and that is the win. Its funny, when I told my old boss I was adopting this idea he immediately told me how much I would love it and how much I would learn. As was typical with Kevin, he has been right. So sign up — no matter who you are or what you do at Stony Brook. It is a chance to engage in ways that are so rare at work. Oh, and you get to be in a group selfie! 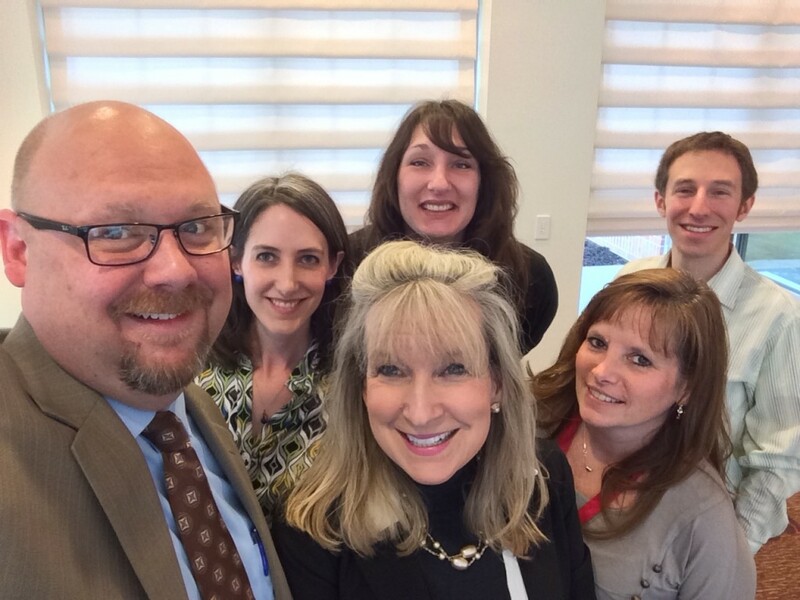 CWC Selfie … Sorry, Terry! I spent yesterday in New York City at the Disruption + Innovation event hosted by Colgate University. I was asked to attend by President Stanley and was excited about it given my long standing interest in disruption in higher education. It was also a great chance to hear Clayton Christiansen share his theories on disruption in general. While I have read “The Innovator’s Dilemma,” it is the core concepts of his more recent work, “Disrupting Class,” that I really wanted to hear him discuss. While at Penn State, I co-taught a graduate course for several years called, “Disruptive Technologies in Teaching and Learning” that was based in part on the work of Clay. So hearing him first hand was a real treat as I am currently redesigning my class to teach here at Stony Brook next year. So what does that really mean? Take for example this simplified version of his story of Toyota. When Toyota really entered the US market, they did so with very low cost cars that provided little margins for existing US automakers. The US auto makers responded by eventually realizing that there was little reason to compete in the low margin world of subcompact, cheap cars when there were so many more profits “up market.” So, in essence, the US auto makers gave that low end market away. What then began to happen is that each new Toyota introduced took another slice of the down market until it squeezed the US auto makers out of each category. Eventually Toyota released the Lexus and the rest is automotive history. But while he spoke, I couldn’t help but focus on the fact that 300 of us (a very well attended event) were sitting in the Times Center — the home of the New York Times, which is clearly a company that has had to make major changes to deal with the disruption in the print news industry by internet “upstarts.” Some in the newspaper business paid attention to the disruption coming their way and innovated through it (and I do believe the Times is an example of this), yet many either didn’t believe it was happening or couldn’t figure out what to do and joined the ranks of folded incumbent daily newspapers all over the country. And as Clay said, we don’t know what is coming in the future, so the ending (and perhaps even the middle) of the news industry “story” is still not known. While I was sitting in the home of the New York Times, I was particularly stunned when six University Presidents took the stage immediately following Clay’s talk and almost all of them said they weren’t worried by the disruption of higher education by both small and large upstarts. The only one who really expressed a concern was the President of Colgate University, Jeffrey Herbst. I was struck with the notion that we had an opportunity to really engage in a lively conversation based on the mounting evidence that we do need to rethink much of what we do to stay ultimately relevant, but it was really more of the same — “higher education has been around since the twelfth century and it cannot be disrupted.” That to me was disheartening. What I was left with was a feeling that by so outwardly dismissing Clay’s theories, many in the audience and panel were in fact bolstering his argument. And I can almost guarantee that, at some conference or event ten years ago, there was a panel of newspaper editors who claimed that they weren’t worried about the future of their papers either. “People will always still want the ritual of holding their newspaper with a cup of coffee in the morning.” Right? So how different is it in higher education when we say “People will always want the experience of going to college?” Or, “Those are just MOOCs and you can’t get credit and people want credit.” Or, “Phoenix Online is just going to take the people who didn’t want to come to a regular college anyway.” In short, doesn’t that lack of worry about disruption sort of sound like we are giving away what we perceive to be the bottom portion of our market? When we sit at panels and say we aren’t worried about the future of higher education because people will always want to go to college, we ignore the other (many) reasons why people educate themselves. The 18-22 market may still prefer a physical experience, but there are thousands of other students at all of our institutions who might not care where they get educated (or how). They just want a good education that will help them advance in their lives and careers. And even many of those 18-22 olds may change their mind as tuition costs rise and the expense of four years or more of college becomes prohibitive. We ignore these factors — and “give away” these students — at our own peril. Yes, education is never going away. That statement is true. But the education industry is changed forever because of Internet and social technology. And it didn’t even start with the internet — but that’s certainly the part of the story we are in now. Content is easily delivered via the Internet and with the rise of social computing, disrupters can finally begin to “move up market” and start to squeeze the incumbent. And, all the while, just like Toyota, the disruptors are in a position to perfect process and scale while they do it. And to go back to my imaginary newspaper editors example, I believe they just had the wrong statement ten years ago. When they said that people will always want their newspaper, they should have said that “People will always want their NEWS.” The editors failed to see that customers of news, over the long run, don’t really mind how that news is delivered, as long as they get their news. And while some still like the nostalgic feel of a newspaper in their hands, that population is dwindling every day. Beyond, some start to realize that the affordances of the new delivery systems allow them to have more convenience, a greater selection of news outlets (you don’t just need to read your local paper or attend your local college anymore), and exposure to different mindsets. And if that is the case, should we be sitting on panels declaring that we aren’t worried? Maybe the problem is the term “worried.” However, by *correctly* saying that “education isn’t going away,” we fail to see the logical follow on: education isn’t going away, but our delivery model and sources might be. And if we put our heads in the sand and don’t think we are going to have to deal with major changes … well, I might like to sell you some classified ads in a newspaper in Brooklyn. We don’t have to be worried, but we do have to be proactive. Our industry has already been disrupted and Clay clearly outlined how his theories could hold true for us in higher education. While I am not completely convinced that it is a 100% apt comparison, he is convincing in several areas. He described the rise of online delivery and how we are seeing technological innovations beginning to take root that can actually supplant the current incumbent of face to face higher education. Again, since I follow his work the leap is not as dramatic as it appears. His claim that as more and more traditional universities ignore the likes of Kahn Academy, the rise of online universities, for profit providers, and upstart innovations such as MOOCs, we will see many of what we consider traditional campuses fall into terrible economic times — culminating in some cases in bankruptcy. But as an aside, you wouldn’t have known it while sitting in the Disruption + Innovation event. The ironic lack of Internet connectivity in the room made things seem a bit off from the start. Here we were discussing the coming (I would argue, already here) wave of disruption on our campuses due to the growth and acceptance of the online delivery of content and you couldn’t connect to the very mechanism facilitating it all — the Internet. Typically at events like this, the room would be busy participating along with the actors on stage — taking photos, tweeting quotes, and engaging in an active backchannel conversation. None of that was doable and I can’t tell if it was intentional, an oversight, or a shortcoming of the venue. If the organizers wanted it to be an Internet free zone, maybe they were trying to prove that life is better lived in the moment then shared wildly across the network? For me, and I’m sure for many others in the room, it limited the potential experience of the event to not have a back channel to continue to discuss the disruption we all face. A real, ongoing community could have evolved from the event with a simple Twitter hashtag and we lost out on that opportunity. At the end of the day, I was thrilled to listen to Clay talk and take part in the overall discussion. I don’t want to sound negative about the event, because in many ways it exceeded my expectations. I was left feeling the way I feel after many events hoping to explore the future of higher education — excited by the future and encouraged by the discourse. I remain bullish on Higher Education and think it is one of the greatest institutions in America. Yes, there are real challenges, but that doesn’t mean that we can’t face them and emerge stronger. Here at Stony Brook, we work every day to improve the lives of our faculty, staff, and students all while controlling costs and building a more operationally efficient University. We cannot continue to do that without both disruption and innovation. What I hope is that more institutions take this discussion seriously so we can all continue to provide the exceptional opportunities that have been the hallmark of attending college. When I arrived at Stony Brook I was thrilled to see a team in DoIT that worked hard every day to help support and grow this University. I continue to be struck by the overwhelming commitment we have to the mission and goals of Stony Brook. With that said, all great organizations need to promote and believe in a core set of values. I had the chance to work with our senior leadership team in the creation of value statements that I shared with each of you in our Yammer space. Looking back at that thread there was a very lively and engaged discussion over the formulation of our final statements. What I have below represents the anchor points for us as DoIT. I am proud of these statements and will use them as a guiding framework in my work going forward. Communicate: We are committed to engagement, communication, and sharing information with a human voice. Grow: We will actively hire great people, develop their growth, encourage a healthy work/life balance, promote a diversity of voices, and support our staff. Satisfy: We will work to delight our customers in the innovative delivery of our solutions and services. Engage: We will work collaboratively across the Institution to provide a responsive IT environment that enriches and enhances teaching, learning, service, and research. Innovate: We will encourage innovation, even where concrete business benefit is not initially apparent. Over the coming weeks you will see these promoted more in our spaces around campus in various forms. I want us to continue to engage in conversations around these values and continue to build meaning from them to help guide our decisions and actions. These are principles that can give us agency in our ongoing initiatives and should provide sign posts to guide us towards always doing the right thing. 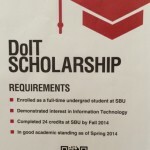 The employees of the Division of Information Technology DoIT at Stony Brook University established an undergraduate scholarship fund to offer support towards educational expenses to a continuing student who has demonstrated an interest in the field of information technology. 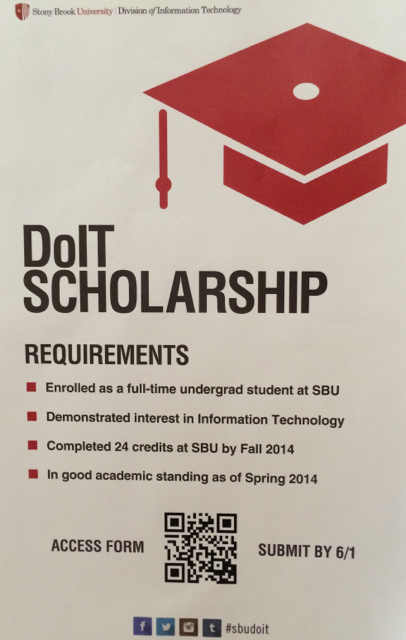 via DoIT Scholarship Applications Due June 1.